• To explore the ski mountaineering possibilities in the Svaneti region near the village of Ushguli (highest village in Europe). 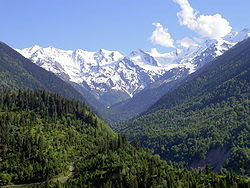 • To investigate how we may help the newly formed Svaneti Mountaineering Tourism Center. • To expose people to the Hans Saari Memorial Fund and to communicate the principles on which it was founded.